NFL viewing: just a fumble? The NFL season kicked off last week, and it wasn’t a particularly strong start for TV’s most watched program. The Falcons vs. Eagles rating was down 11% from last year (when the Chiefs handsomely beat the Patriots) and in fact, it drew the lowest rating for an opening game in a decade. NFL pundits will cite a lackluster game that had a delayed start, and therefore late finish, on a week day. However, this doesn’t feel like a fumble. After mostly plateauing since 2010, NFL ratings fell sharply in both the 2016 and 2017 seasons (see chart below). And there too, there’s been many excuses: Trump elections, kneeling, player scandals, injured superstar players, concussions (fewer kids playing and watching), etc. It is not uncommon for an industry to find a scapegoat for its own troubles (e.g. like the music industry blamed piracy in 2001 when sales cratered with more than 50% in just a few years). To the NFL’s defense, they are not alone. NASCAR fans have raced away from the TV, NHL is skating on thin ice, and the MLB isn’t really hitting it out of the park, either. Without doing much research, here too we can most likely come up with many (good?) reasons. Meanwhile, a recent study by Nielsen showed that TV viewing is up 8% compared to just six months ago (for a whopping 4 hours and 46 minutes average per day). As such, it may just be so that viewership for some of America’s most favorite sports are impacted by something much more profound. While sports viewership is on the decline, cord-cutting has been steadily increasing. Cord cutters now make up for a massive audience (projected to 20% of the US population in 2022, according to eMarketer). They haven’t left TV, but simply shifted their viewing habits towards cheaper content on Netflix, Hulu, Amazon Prime, etc. The programming on these new OTT (over-the-top) services is nothing to sniff at either: high quality shows (often featuring A-list movie celebrities in big-Hollywood style productions), and more of it than ever before (the number of scripted TV shows in the US has more than doubled since 2010). OTT services are, however, missing one big category: (live) sports. Airings of live sports remain locked up in multi-billion dollar deals with the traditional cable companies, broadcasters and satellite providers. And right there sits the fundamental reason for the NFL’s woes: an increasing amount of the population can no longer watch the games at home. 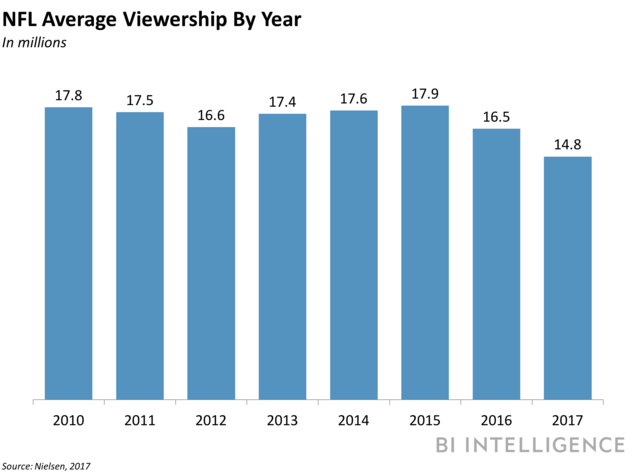 It is not a stretch to see how 3M+ added cord cutters in 2017 (see Variety) translate into an average 1.7M decline in NFL broadcast viewers the same year (see graph above). As troublesome as it sounds for the NFL, it shouldn’t worry advertisers too much. Football still draws a massive, unparalleled, audience and there are many amazing games coming up this season. If anything, it won’t be too long before OTT players will meaningfully bid for the future rights (Amazon and Twitter are sure dabbling into it). This will not only bring viewers back, but possibly even bring about new ad experiences which one can’t find in the traditional linear TV industry. Consider this year (and possibly the next two years) a time-out before an exciting reversal in the game.